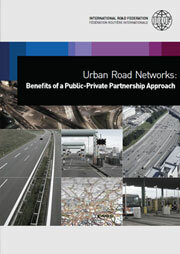 A dedicated IRF newsletter on Intelligent Transport Systems could not be timelier. IRF’s activities in this domain, especially through its Policy Committee on ITS, have been plenty and fruitful. Highly informative meetings of the committee have taken place in Leeds, Busan and Stockholm over the past two-thirds of the year, and the deliberations have been profound. Time now to consolidate and share the findings; which is what the committee is currently working on in the form of a publication. Strengthening our collaboration with relevant partners is also on the way. This 2nd edition of the IRF newsletter dedicated to ITS will give you a view on the latest developments in ITS strategies in general and the Policy Committee work in specific. There will be numerous opportunities to meet in the second half of this year, with IRF Policy Committee events taking place in Delft, Mexico City, and Orlando. We would like to extend a warm personal invitation to you to join us on these occasions. 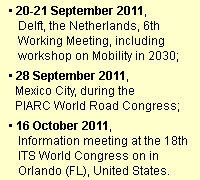 For detailed information on the meetings, including dates, please be referred to our meeting calendar. From March till end of May 2011, the United Nations Economic Commission for Europe (UNECE) held a stakeholder consultation on the future deployment of ITS. The consultation was based on a strategic note of the UNECE’s Transport Division, outlining the potential of ITS as the future to enhance mobility and to bring about a new culture for doing business, based on system performance and customer satisfaction. This article contains a copy of an interview held by the Russian magazine LogLink on 16 May 2011 with Josef Czako, chairman of the IRF Policy Committee on ITS. The European Commission held its 2nd ITS Conference in conjunction with the ITS in Europe congress on Monday 6 June in Lyon, France. The Conference was attended by some 200 representatives from European institutions and stakeholder organisations from the public and private sector. On Tuesday 7 June, in the margins of the ITS in Europe congress in Lyon, IRF met with representatives of the EasyWay project to discuss possibilities for future collaboration. A demo version of the widely anticipated 2DECIDE Toolkit was shown during the recently held ITS in Europe Congress in Lyon. The objective of the 2DECIDE project is to develop an online tool to assist transport authorities in the deployment of Intelligent Transport Systems (ITS), to help them solve traffic and transport problems and address policy objectives. In this respect 2DECIDE has been designed for traffic and transport experts - even if they have little experience with ITS solutions. A test version of the tool is now available. For more information and to enlist as a test user, please visit the 2DECIDE website: www.2decide.eu.